Do you ever look around you and think, Gee, what’s with all of these really, really, really stupid people?? Or maybe you feel that the US is doing a little backslide into degeneracy? I think everyone feels that way every now and again, and probably every person asked would have a different type of person they’d like to see just push off. God Bless America shows just what happens when someone reaches the end and decides to do something about it. Sure, the obvious comparison here is Falling Down with Michael Douglas. I’m not arguing. They have very similar themes. 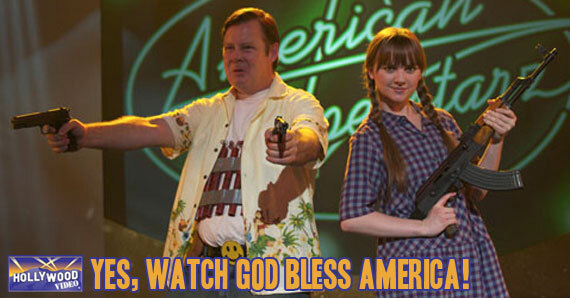 But they are radically different movies, and I think God Bless America is more of a comedy. Like Office Space with people getting killed. Also, it’s an indie flick, so it doesn’t have the same star power as Falling Down. While Joel Murray has been around, his co-stars are all pretty much new to the screen. Oh, Larry Miller is in it. He’s pretty funny in most of the things I’ve seen him in, but in this he doesnt actually have a lot of lines. The only quibble I really have with the movie is it’s a bit hypocritical. At one point, main character Frank says how modern shock comedy is not really funny. It’s not edgy, it’s just rubbish. He goes on to make quite a point about the degradation of humor and our culture in general because we’ve become so jaded. He even suggests that the stars of Two Girls, One Cup will eventually have a VH1 show. And while his dialogue is pretty funny, and surprisingly accurate, it makes the movie a hypocrite. Just moments earlier, we saw a fantasy Frank was having where he straight murders his neighbors, including their child in a most disturbing manner. It was gory, graphic and funny as hell, but it was certainly a shock humor type of joke. The exact same thing Frank is bitching about moments later. God Bless America isn’t going to win any awards, and its message is a little too vague to sway any non-believers. But if you like the idea of someone standing up for what they believe in, against all the people who represent everything that’s wrong in society, then God Bless America is the perfect movie for you. Check it out on a VOD service near you. This entry was posted in Reviews, The HV Blog and tagged falling down, god bless america, joel murray, larry miller, michael douglas, office space by rlaitinen. Bookmark the permalink. Robert is a writer based in North Carolina. He also writes for Game Crazy and Movie Gallery. You can circle him on G+ or follow him on Twitter.